Accidents or medical emergencies can happen anytime. Ambulance take patients to the ER over 16 million times each year in the US. It is the most important to make sure that we can get best care possible is by alerting emergency professionals and giving them the information they need about our health conditions promptly. 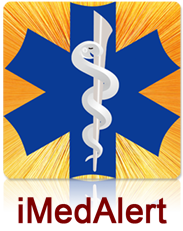 iMedAlert is a powerful and user-friendly medical alert application for your phone. In case of an emergency, iMedAlert iPhone not only can immediately alert emergency responders by phone or alarm, but also can broadcast rescues message with your current GPS location* and complete medical profile (e.g. your personal information, blood type, medical history, allergies, medication) to selected receipts via SMS and email. The accuracy of GPS location is varied with the performance of your phone’s OS and GPS device. iMedAlert apps can help save lives. COUNTS WITH iMedAlert. DOWNLOAD NOW! PLEASE WATCH THE ONLINE VIDEO TUTORIALS FOR OUR APPS. or emergency personnel by sounding an alarm at regular intervals. to quickly send a predefined emergency SMS to a list of predefined contacts. information, blood type, medical history, and allergy information. This will help emergency personnel treat you better. can be set to include location information. emergency personnel treat you better. If you are able to speak, you can use the app to call emergency services. accessed by Divoti Inc.(DBA DivotiUSA.com), its associates or any unauthorized third parties.